Would you like a piece of heaven on Earth? 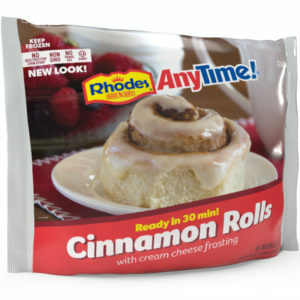 These ooey, gooey Rhodes Bake-N-Serv® AnyTime!® Caramel Rolls are simply divine. Smothered in caramel these rolls will have your mouthwatering as soon as they go into the oven. Our AnyTime!® Caramel Rolls are packaged in a convenient 6-count aluminum pan to make cleanup a breeze. Remove frozen rolls from paper baking pan. Microwave caramel packet on high for 20 seconds. Squeeze caramel into bottom of empty pan and spread evenly. Return rolls to pan on top of caramel. BAKE 30 – 40 minutes, until rolls are golden brown. Baking time may vary, so watch progress. Allow rolls to cool for at least 5 minutes to allow the caramel to cool. Using a spatula, lift each roll from the pan and place on a serving plate. HANDLE CAREFULLY to prevent burns from hot caramel. INGREDIENTS: Unbleached enriched white flour (wheat flour, malted barley flour, niacin, ferrous sulfate or reduced iron, thiamin mononitrate, riboflavin, folic acid), water, vegetable shortening, brown sugar, sugar, yeast, nonfat dry milk, soybean and/or canola oil, cinnamon, wheat starch, natural and artificial flavor, sodium bicarbonate, sodium aluminum phosphate, salt, rice flour, sunflower oil, sunflower lecithin, guar gum, dicalcium phosphate, polysorbate 60, monoglycerides, enzyme. CARAMEL: brown sugar, butter, tapioca syrup, water, cream cheese (pasteurized milk and cream, cheese culture, salt, carob bean gum), natural and artificial flavor, cinnamon. Individuals with food allergies: This product contains milk in the roll and topping. 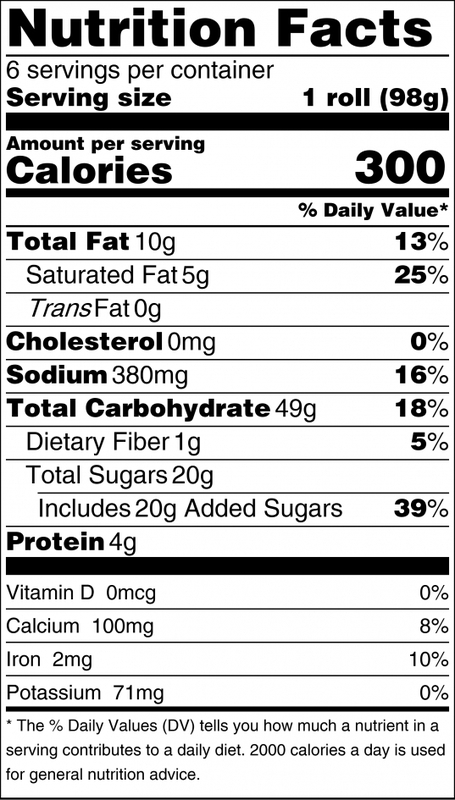 This product is manufactured in a facility that processes foods containing wheat and milk.